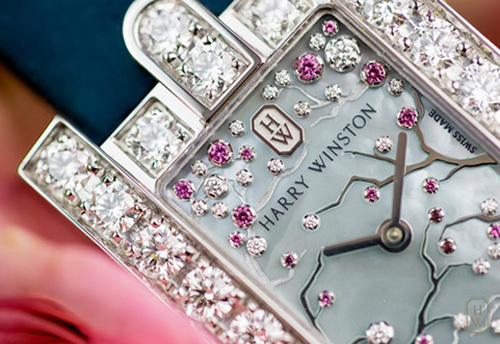 Harry Winston is known around the world for its luxury watch and jewelry collections. With the completion of this years Baselworld show in Switzerland, we wanted to share the The Avenue Collection luxury watch from Harry Winston. Representing the dynamic essence of New York City, The Avenue Collection™ from Harry Winston is a gorgeous watch collection. The latest release is named after iconic Fifth Avenue in New York City. Fif th Avenue is arguably the most prestigious address for luxury shopping in the world. In addition, one other note is that Harry Winston operates its Flagship Salon. Designed after the popular Art Deco era, The Avenue Collection is beautifully streamlined. By capturing the Art Deco period, this new watch collection will surely turn heads in any social setting. For 2017, Harry Winston has introduced four new watches – Avenue C Mini Moon Phase, Avenue Classic Cherry Blossom, Avenue Classic Automatic and Avenue C Dual Time. All four luxury timepieces are exquisite. All these watches in The Avenue Collection feature a new gold folding clasp in the strap. Due to this design, owners can appreciate the comfort and security it brings. To add an elegant finish to the each watch, notice the seamless alligator strap. First is the Avenue C Mini Moon Phase. This watch delivers a hint of heaven. The watch’s romantic, moon phase complication stands out. There are numerous vintage touches as well. As a result, the watch focuses upon the prevailing Art Deco mood of the Avenue Collection. Watch connoisseurs will notice the Avenue C Mini Moon Phase is one of the smallest moon phase complications found today. It has a compelling feminine look and would make an ideal gift. Representing the beauty of the Japanese Sakura season, this fine watch was design and built with pride. With an artistic look, a recreation of annual blooming of the cherry blossom tree is on display. By suing stunning diamonds, this luxury watch is also adorned with pink sapphires. This spectacular watch is the first woman’s timepiece in the Avenue Classic Collection that is fitted with an automatic movement. This design becomes another important milestone for Harry Winston. There is a growing demand for fine mechanical movements in the female customer demographic. As a result, Harry Winston realized this opportunity and made an effort to design a splendid timepiece. Last but not least, the Avenue C Dual Time is another example of professional craftsmanship. This particular watch comes with a second time zone function. It’s perfect for active women who can quickly view two separate counters on the watch dial. Therefore, while traveling you can see the time back home plus the city your are in. By utilizing the double crowns on the case, even non-standard time differences of half-hour and quarter-hour deviations can be observed. Another example of including a needed feature for those who desire it. Any of these beautiful watches from Harry Winston would make a perfect gift for any special occasion. A birthday, graduation, anniversary or just to show your love. If interested in learning more or purchasing a luxury watch from The Avenue Collection, let us know. Whether it’s Harry Winston or another top luxury watch brand, our specialists can help. Read our luxury blog for more luxury watch news.